Once Moses’ mother, Jocheved, paradoxically obeyed Pharaoh and “threw” her son in the Nile, Pharaoh’s daughter discovered the baby. Moses’ sister followed the basket and offered the king’s daughter suggestions on how to care for the child. Daughters are prominent in this part of the story, the word occurring six times. “Certainly our attention is being drawn to the ironic connection between Pharaoh’s intent to spare the daughters and the fact that a succession of daughters, the last being his own, contributes to his undoing” (Ackerman, p.95). Overall women dominate the first chapters of Exodus prompting us to wonder about the significance of women in ancient Israelite storytelling. “The question is not why does a story of daughters form the prelude to the exodus, but rather: what effect do these stories about women have on the way we read the exodus story as a whole?” (Exum, p. 60). In particular, I want to explore the way in which the king of Egypt’s own daughter determined the outcome of the story of the exodus. Was Her Name Bithiah (aka Batyah/Bityah)? In post-biblical literature, Pharaoh’s daughter receives a great many names. Most prominent is the name Bithiah based on a passing comment in the genealogical list in 1 Chron. 4:18. “These were the sons of Bithiah daughter of Pharaoh, whom Mered married.” According to Chronicles, Bithiah was one of two wives of Mered, a man descended from Caleb and therefore probably from the tribe of Judah. Interestingly, she gave birth to two sons and a daughter named Miriam. If Bithiah of Chronicles is the adopted mother of Moses, then giving her daughter this name was highly poignant and speaks to a warm relationship between the princess and Moses’ sister. It also signals that the princess left her privileged life to wander with the former slaves in the desert where she started a family among the Israelites. Bithiah (Bitte-Ya, daughter of Ya) is clearly Semitic (Steiner, p.396). “The Midrash comments that her name indicates that she was a daughter of God (bat-Yah): ‘The Holy One, blessed be He, said to Bithiah the daughter of Pharaoh: ‘Moses was not your son, yet you called him your son; you, too, though you are not My daughter, yet I will call My daughter'” (Bronner, pp.55-6 citing Lev. Rab. 1:3). There are a wealth of rabbinic stories about Pharaoh’s daughter which you can discover elsewhere. Historically, there was only one known Egyptian princess to have a Semitic name: Bit(i)-Anat, the eldest daughter of Ramesses II. “It is obvious that the name Bit(i)-Anat ‘daughter of Anat’ is very similar to the name Bitte-Ya ‘daughter of Ya'” (Steiner, pp.402-3). If the two daughters were one and the same, then the Pharaoh of Exodus would be Ramses II. If we follow Jewish tradition which dates the exodus at 1313 B.C.E., we run into a problem– Ramses ruled somewhat later. “On the other hand, as the Egyptian calendar was not linear–that is, it did not count years– historians’ estimates of yearly dates of Egyptian events are only estimates, and could be slightly inaccurate” (Antonelli, p. 142). Obviously we don’t have any definitive evidence of her name but this is an intriguing possibility. The issues with Egyptian dating leads to another possibility as suggested by the Egyptologist Rohl. In his provocative and highly researched book A Test of Time, he concludes that the timing and circumstances fits better with another pharaoh: Palmanothes. Rohl claims to have found evidence that this pharaoh persecuted the Hebrews. Palmanothes had a daughter named Merris who adopted a Hebrew child who grew up in the palace and was named Prince Mousos. The prince led a military campaign to the land of Cush (Ethiopia). (By the way, this might be where Moses picked up his Cushite wife.) Returning victorious, Mousos aroused the jealousy of the new king Khenephres. In fear of his life, Mousos fled to Arabia only to return after Khenephres’ death to lead the Hebrew people to freedom (Rohl, p.301ff). Keep in mind that Rohl’s work is hotly debated and defended in scholarship. However, Rohl certainly offers another intriguing possibility. We get a glimpse of the princesses’ compassion in the way the story is told: she responded to the baby because he was crying. Later on we learn that she also showed tenderness to Moses’ entire family, including paying Moses’ mother to nurse the baby when the princess had every right not to. Pharaoh’s daughter immediately focused on the boy’s ethnicity. Since Pharaoh addressed “all his people” when he announced that the Hebrew boys were to be drowned in the river, this is a very tense moment in the narrative. Will she fulfill her father’s command or act upon her emotional impulse? At that moment the child’s sister, presumably Miriam, approached and asked the king’s daughter, “Shall I go and summon a wet nurse from among the Hebrews that she might nurse the child for you?” This was a bold inquiry since there is little, if no indication, that Pharaoh’s daughter had made any decision about keeping the baby. By “posing the question in this way, Miriam presents Pharaoh’s daughter with the situation as though the latter had already decided to rescue the child…her question requires enormous courage, of course, since it openly violates Pharaoh’s decree…The crying of the child can be alleviated, Miriam implies, if Pharaoh’s daughter will yield to Miriam’s suggestions. In short, Miriam’s question is framed with such care that the question itself shapes the moral response of Pharaoh’s daughter” (Lapsley, pp.77-8). Without even discussing the matter of defiance of the decree, the princess assents and the two daughters become cohorts in rebellion. It’s hard not to miss the humor in the Pharaoh’s daughter paying a slave, Moses’ mother, to nurse her own baby. Ancient audiences of this tale must have reveled in this story of the victim turned victor. We “who hear the story know there will only be ear-to-ear grins and great delight over this final ‘put on’ of ole’ massa. The ethos we feel here is the humorous irony often found in slave literature. Imagine the enjoyment, the sheer relish, of early audiences to this turn of events. 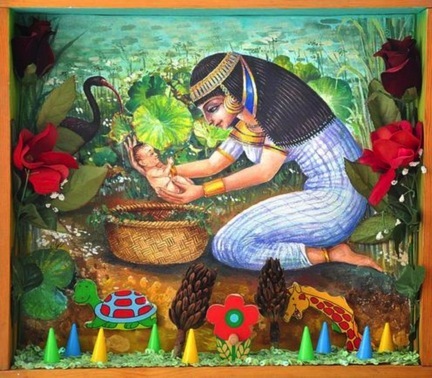 The child is delivered from Pharaoh’s clutches by being given over into his daughter’s hands!” (Ackerman, pp. 93-4). Once back in the slave quarters, I imagine Miriam enjoyed telling her tale. Aside from the humor, it appears that there is historical evidence for the princess’s actions. Sarna writes, “that the princess can personally execute such a contract accords with the relatively high social and legal position of women in Egypt. She possessed right of inheritance and disposal of property, and she enjoyed a fair measure of economic independence” (p. 10, n. 7-10). Based on extra-biblical evidence, Childs suggests that providing wages for a wet nurse was a legal process that confirmed the right of the payer to claim the child. The act of naming the child represents the transfer of maternity from the biological mother to the adoptive one (Reinhartz, p.104). Apparently elite Egyptians routinely adopted the children of their vassal rulers and raised them in their palaces as if they were their own (Meyers, p.9). Though the princess knowingly defied her father, she followed traditional Egyptian practices by naming Moses. The name Moses is Egyptian meaning “son of.” Some scholars suggest that she may have named him after a god in the tradition of Thutmosis, Ahmosis, etc. and the first part of his name was lost due to the impropriety of a Hebrew leader being named after a pagan god. Ackerman contends that the princess accidentally named the boy “Moses” because the story is only interested in the Hebrew meaning of the name. “The princess is quite correct that m-sh-h means ‘to draw out’ in Hebrew. So far, so good… But she missed the lesson concerning the formation of Hebrew participles. She thinks that ‘Moses’ means ‘the one drawn out of the water,’ but the passive participle would be ‘Mashuy.’ Because she does not have total command of the language, she mistakenly names him with the active participle (‘the drawer out’)! An insignificant detail? Hardly” (Ackerman, pp.94-5). However, rather than finding the princess to be a buffoon, I propose that since she knowingly defied her father, she knowingly named the boy “Moses” as a subtle act of protest. Together with Miriam and Jocheved, it appears that the king’s daughter was fomenting a rebellion against her father. The narrator directs us to this conclusion by using the same word in describing Moses being drawn out of the reeds just as he will draw his people through the Reed Sea. I’m not suggesting that Pharaoh’s daughter was a prophetess of the future by naming her adopted son Moses; rather, the narrator wanted the audience to understand that she was involved in the planning of the exodus from early on, that the princess was meant to be an ongoing presence throughout the liberation story. Propp observes that Pharaoh’s daughter was a symbol for God who rescued Israel from the waters and then “adopted” the Hebrew people (p.154). And like God looking after the Israelites she “‘comes down,’ ‘sees’ the child, ‘hears’ its cry, takes pity on him, draws him out of the water, and provides for his daily needs” (Fretheim). Pharaoh’s daughter was painted in very positive colors by being compared to God. High praise by biblical standards! It’s hard to imagine that the exodus could have happened if it weren’t for the mothering of this foreign woman. The divine purpose seems to rest on women giving life, being wise and resourceful and resisting oppression. The story values the women not just for their childbearing capacity but also for their admirable personal characteristics. The “text reveals Pharaoh’s and (and the culture’s) prejudice against the women to be not only mistaken, but as having catastrophic consequences for those so persuaded. As Katharine Doob Sakenfeld has observed about the book of Ruth, one must look ‘beyond the specific social structures to their underlying principals.’ The story subtly invites the reader to reflect theologically on the internal contradictions of such a sexist ideology, just as the presence of the text attests to God’s rejection of the twisted logic that feeds it” (Lapsley, p.75). One might object, from a feminist perspective, that the tale of Pharaoh’s daughter is a marginal story because she disappears just in time for the “real” story of Moses to be told. “To some feminist readers [the women’s] literal disappearance symbolizes the disturbing reality that women are merely tools of patriarchy, brought on the scene to rescue a baby so that a man could go on to the greater glory of liberating Israel. But much depends on where one thinks the story ends” (Lapsley, p.79). By echoing the princesses’ actions throughout the exodus story, the narrator has kept her active in the greater story of the liberation of Israel. She is the model of those who save and protect the most vulnerable members of society. For this reason, she not only lives on within the Bible, but in the contemporary world, she should be known as a model of justice and compassion. Childs, Brevard S. – “The Birth of Moses” Journal of Biblical Literature 84 (1965) 109-22. Lo, H.C. – “Bithiah” The Anchor Bible Dictionary, David Noel Freedman, ed. (New York: Doubleday, 1992) 1:750. Reinhartz, Adele – “Why Ask My Name?” Anonymity & Identity in Biblical Narrative (New York: Oxfrod Univ. Press, 1998). Steiner, Richard C. – “Bitte-Yâ, Daughter of Pharaoh (1 Chr 4, 18) and Bint(i)-`Anat, Daughter of Ramesses II,” Biblica 79 (1998), 394-408.